I’ve tried a lot of homemade bug spray recipes. Some were just terrible. I remember taking one concoction camping and I’m pretty sure that I was attracting every mosquito in the county with that particular formula! 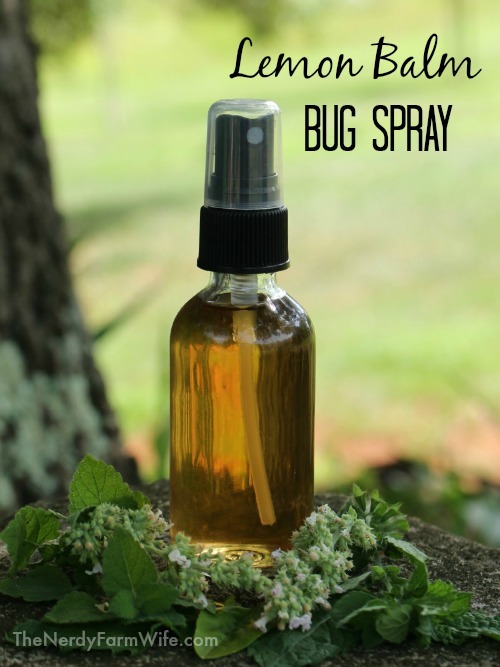 On a weekly basis, readers write in to ask about homemade insect repellents, but until now, I hadn’t developed a recipe I felt comfortable recommending. This one works for me, my family and friends that tested it, at a 100% success rate, so I’m happy to finally have an effective solution to offer. The best part is that it’s yet another way to help use up some of my abundance of lemon balm and other herbs! If you don’t have some of the herbs listed, that’s okay. I adapt it to what I have on hand. You can make it with just lemon balm if you want. I do think the synergy of all of them makes for the best results though. plus a generous pinch each of basil, catnip and mint from your garden. Stuff a glass jar full of the herb leaves, then pour witch hazel extract over them, almost to the top. You can usually find witch hazel in your local drug store or in the pharmacy section of a grocery store. Cap the jar and set it in a cool, dark cupboard for a week or two. Strain and store out of heat and light. When you’re ready to mix up a fresh batch of spray, fill a small glass spray bottle or mister half way with the infused witch hazel. You can buy the little bottles shown from SpecialtyBottle.com. Fill the rest of the bottle with water, but not quite to the top. At this point, I add a few drops of essential oil, to boost the spray’s power. Without the essential oil, it’s not very strong, so I highly recommend adding them. You might wish to add more or less depending on your tolerance for essential oils. I’m very conservative with their use, so feel free to adjust to your preference. If you’re pregnant, nursing, or have chronic health issues, research each essential oil and consult a qualified professional for further guidance on usage for your condition. Screw the spritzer top onto the glass bottle and shake well. Spritz on and around you as needed for bug control, shaking thoroughly before each application. We’ve found this exact combination will last an average of one to two hours before needing to be reapplied, but that will also depend on your particular body chemistry and how heavy the bug load in the area is. Once you’ve mixed up a batch with water, try to use it up within a few weeks. The remaining undiluted witch hazel will last at least six months to a year, or longer. This spray is intended for people, not pets. 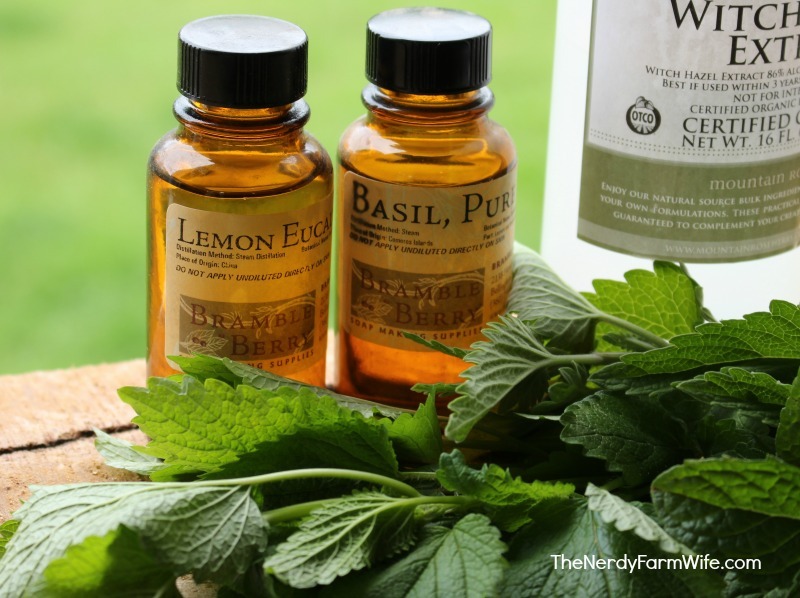 If you enjoyed reading about how to make a lemon balm bug spray, let’s keep in touch! If you like the projects on my site, you’ll love my new book – 101 Easy Homemade Products for Your Skin, Health & Home! and wherever books are sold! Tagged bug repellant, bug spray, insect repellant, insect spray, lemon balm. Bookmark the permalink. Yet another winner, Jan! Thanks for this “tried and tested” and detailed information. We have our fair share of mosquitoes here at night and the resident barn and cliff swallows are just not keeping up with their duties! Hi Farmer Doug, I’m glad you like the recipe! I hope it helps with those pesky mosquitoes! Do you have to dry the herbs first? With an oil infusion you have to so it will not mold. Just wondering if it is different with the witch hazel. Hi Pam! 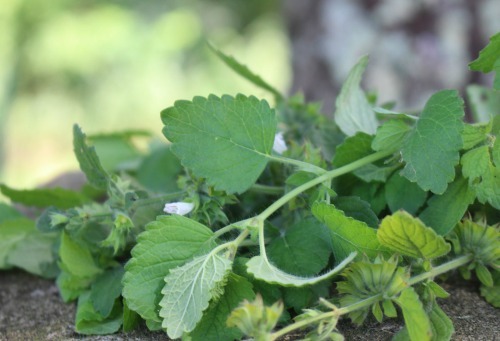 You can use dried lemon balm if you don’t have fresh, but you don’t have to. I believe that fresh herbs make for a more effective spray, so recommend those above dried for this recipe. Since witch hazel is water and alcohol extracted, mold is not a problem. The herbs will usually turn the witch hazel brownish, but it’s still perfectly fine to use. In an oil infusion, water content won’t mix in and can ferment or mold, so I agree with you that freshly dried herbs are best for those. Hi Jan – I don’t have catnip in the garden or citronella in my essential oil cabinet. Do you think it will still work? Thanks!! Hi Lea! I think it will work fine; just use an extra drop or two of lemon eucalyptus or lemongrass & give it a go! Thanks for the great recipe! A great flea repellent for dogs is brewer’s yeast- the kind you find in the vitamin section. One tablet a day makes your dog taste bad so fleas go elsewhere. It’s the only thing I’ve used on my dogs for over 20 years.The dogs think it’s a treat and come running when they hear the bottle shake! Gail…I dont understand but how did you that? did you just spray on your dog..or something?? Hi Terry! The cheesecloth will probably help. I usually put a layer of plastic wrap between a tincture and a metal lid or either just use a plastic lid. Especially with vinegar, but also with alcohol based, the liquid will get against the metal and start to rust. This makes it difficult to open and will eventually make your tincture taste off. It’s more of a problem with vinegar though, than alcohol, so I think yours will be fine! I will be making this over the upcoming weekend. My family is known for being bitten worse than everyone else, so we will truly be putting this to the test. My son’s got such sensitive skin, he actually gets what look like grease splatter blisters from a lot of his bites, around day 3 or 4 so we would really like to prevent him from getting bitten at all! I will let you know how it works out! Thank you for sharing all of your knowledge with us all! Hi Sarah, I can commiserate with you. When I was a kid, all of the biting bugs in the county gravitated to my brother & I. Benadryl was a daily beverage! 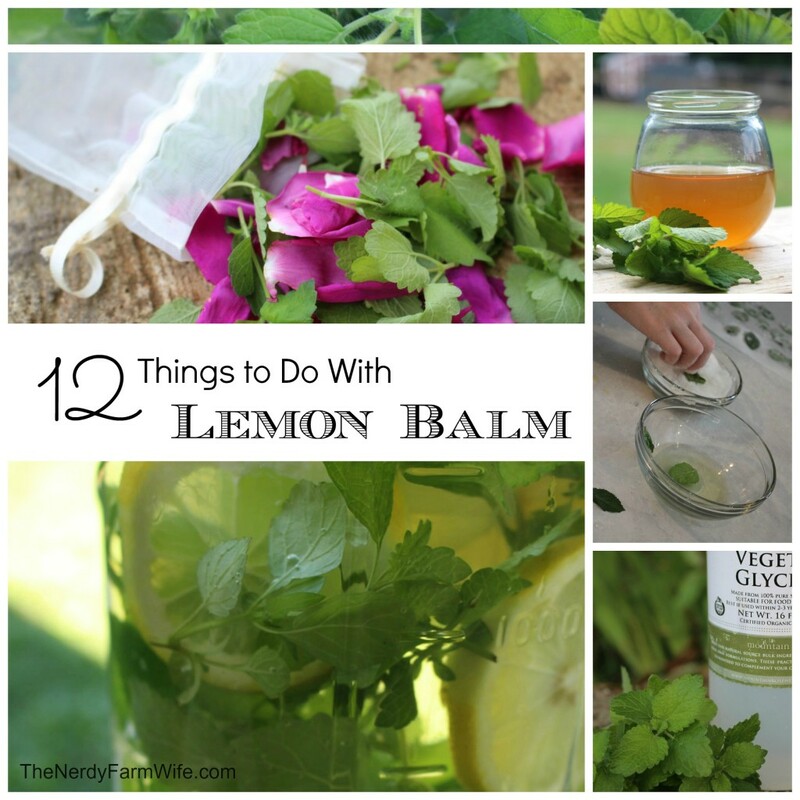 I sure hope the lemon balm spray helps prevent some discomfort for your family – I’d love to hear how it goes! Hi Jan, I have a question. Why do you use witch hazel extract? What does it add to this mixture?? Hi Paulette! I use witch hazel to help extract the properties of the herb. I’ve seen people use vinegar instead but I (a.) don’t want to smell like vinegar and (b.) think it attracts gnats, which are bad where I live. You could probably just make a tea and use, but the shelf life would be really short (a day or two), whereas witch hazel lasts a lot longer. Thanks so much! I have all the stuff and can’t. Wait to get started. Wonderful! I hope you like the recipe! What is the minimum time for the witch hazel to become infused with the herbs? I am going on a river rafting trip and would love to make some to take before I go. Hi Ida! I’ve let them infuse only about two days before when a relative needed an emergency batch since the bugs were driving her crazy gardening. She said it still worked! I did add an extra couple drops of essential oil though in case the mixture wasn’t strong enough. Do you think if a tea was made with lemon balm, basil and mint and was used in place of the water when the witch hazel infusion is mixed that it could replace the need for essential oils? Just thinking of different options that could lower cost some since we don’t have those eo in our pantry but I’ve basil, mint and lemon balm going crazy in the garden. By the way I stumbled upon your site today for the first time searching for herbal soap recipes. Your recipes gave me lots of inspiration. Thanks. 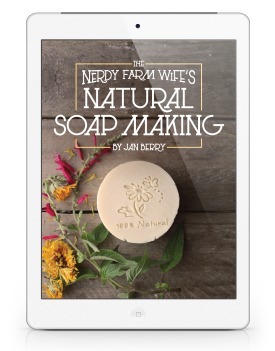 Hi Juniper, I’m happy you liked the soap recipes! I think you could definitely try a lemon balm/basil/mint tea instead of plain water + essential oils. You may need to reapply it more often because it might not be as strong, but especially if you have plenty of plants to play with, worth an experiment! Does the witch hazel you use contain alcohol? Hi Luc! Yes, the witch hazel I use comes from MountainRoseHerbs.com and has 14% alcohol, but I’ve seen alcohol free versions here: http://www.newdirectionsaromatics.com/witch-hazel-distillate-alcohol-free-p-2091.html and on Amazon.com. 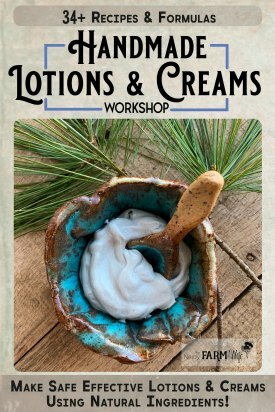 Just wondering if I could possibly go a step further and make a soap with some of the same essential oils for use while camping? I know they recommend unscented soaps and deodorants due to the perfumes attracting bugs while camping but what if I put some bug-repelling scents into a liquid or bar soap? Hi Felicia, I think that’s a great idea! The only thing you’d need to look out for is that I think some of the same essential oils that repel insects are also toxic to fish and other aquatic creatures so you want to avoid using them around streams and bodies of water. (IF I’m remembering correctly. It’s pre-breakfast so my brain is a little less-sharp at the moment!) :) You could also make a bug repelling lotion bar, to rub on after using unscented soap and it should stick around on your skin longer too. Hi Leslie, Yes, you sure can! Awesome!!! I can’t wait to try this! I live in a forestry area, and the bug population always comes for ME! Thanks, Jan! I Jan, the local preschool is growing lemon balm, yah! so I just made this. I used 5 drops of Citronella and Lemongrass and 3 drops of Basil. Looking forward to giving it a try up here in Northern Australia the mozzies come out in the hundreds and go crazy. Taking B1 (thiamine) helps repel mosquitos. I don’t have any catnip, could I just add more mint? Sidebar…would apple mint be acceptable?